The movie ‘6 Days’ chronicles the events of April 1980 when armed gunmen stormed the Iranian embassy in London and took hostages. Sit down for the next part cause it’s a shocker: the gunmen were an Iranian Arab group that were pissed about things and figured the best way to go about it was to take some civilians hostage and threaten to kill em and stuff. While the Middle East has been on fire for a century, this was bringing the craziness right to London proper. Long story short: the whacky Iranians killed a hostage and the British SAS stormed the building, wasted all but one of the bad dudes, and saved everybody in what was called Operation Nimrod. It was a watershed moment for the SAS and brought this long and storied group into the modern limelight. It also became the spark that ignited the fire of modern special counter terrorism training by the world’s elite forces. Upon watching the flick, I remembered back to flipping through old Osprey and Janes Defence books and seeing those SAS guys looking so bitchin in their ‘black kit’. 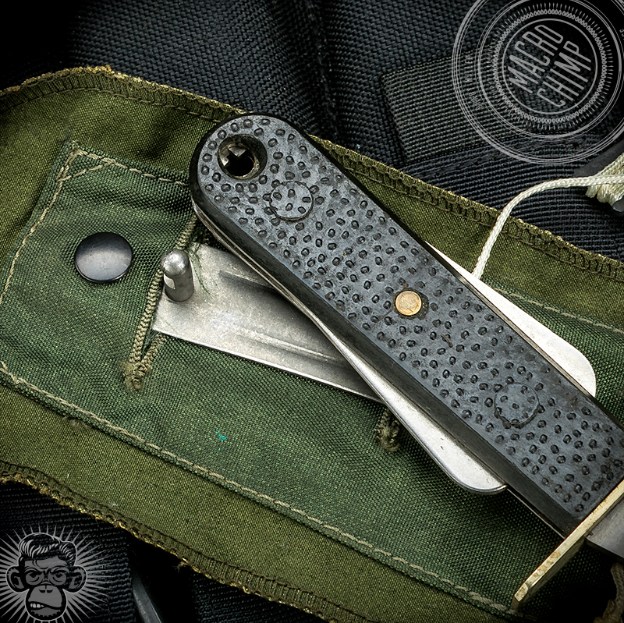 Being a ‘knife dork’ even as a kid, the one detail that always stood out was the green ‘patch’ with a small knife handle protruding from it. 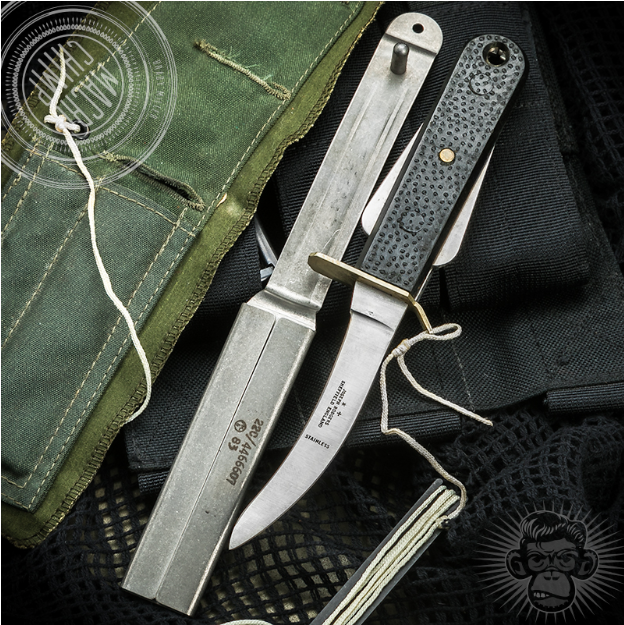 It wasn’t until I got older and began roaming the gun show isles that I learned exactly what that was: the British RAF MK3 Aircrew Emergency Knife. Originally intended to be sewn to a pilot’s gear to cut shroud lines etc. 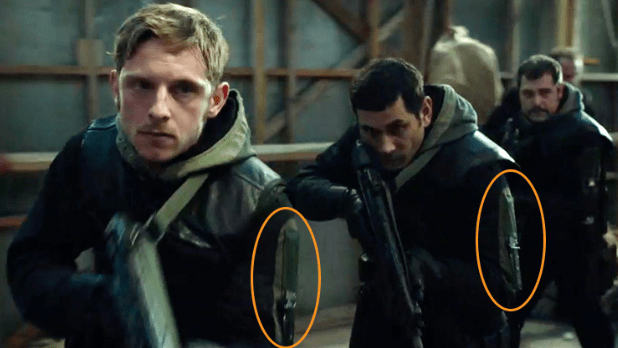 However, If you look through pictures of the SAS through the 1980’s you will see the distinctive green pouch sewn onto their assault vests. It was one of those ‘cool guy’ things I had to track down for the collection as an ‘adult’ (whatever that is)! This picture from the movie shows it sewn to their coveralls, but I have only seen pictures of it attached to vests. Speaking of vests: The SAS assault vests of the day were made out of suede leather and were unarmored. The synthetic materials used in the armor carries back in the day were not flame retardant and could easily melt to the wearers skin if exposed to flame. Therefore, aside from carrying their kit, the assault vests were meant to protect the body armor from flames. 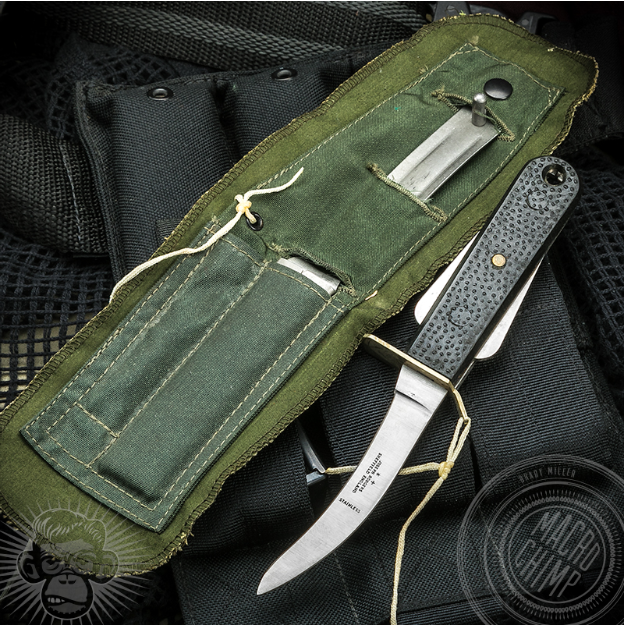 The knife as issued with ample backing to be sewn to flight gear. 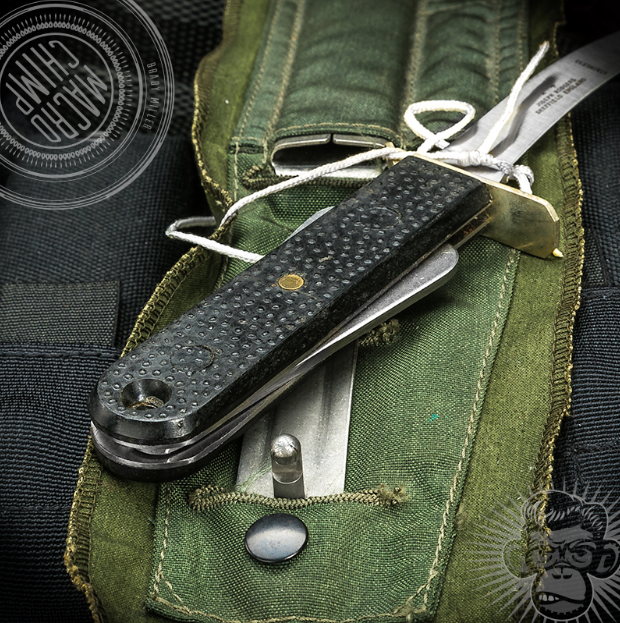 The main pocket holds the metal scabbard for the knife while the small pocket on the left is for the lanyard. The knife is a curved blade design that is only sharpened on the ‘inside’ of the curve. It is marked JOSEPH RODGERS SHEFFIELD ENGLAND and STAINLESS. The guard is a yellow color and I assume is brass. The handle scales are textured black plastic. If you look at the exposed part of the metal scabbard toward the top of the retaining stud, you will see that it has a slight bend to the back that acts as a spring. 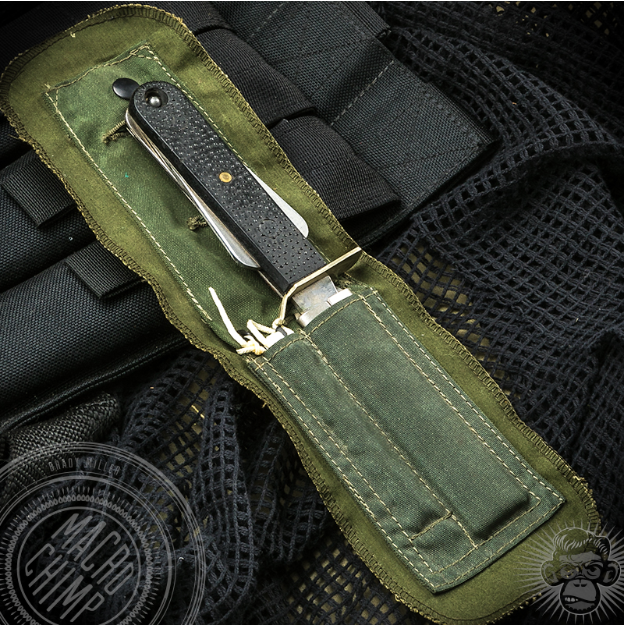 The knife can be securely worn in any position. In order to deploy the knife, you grasp the handle pressing in the two ‘wings’. 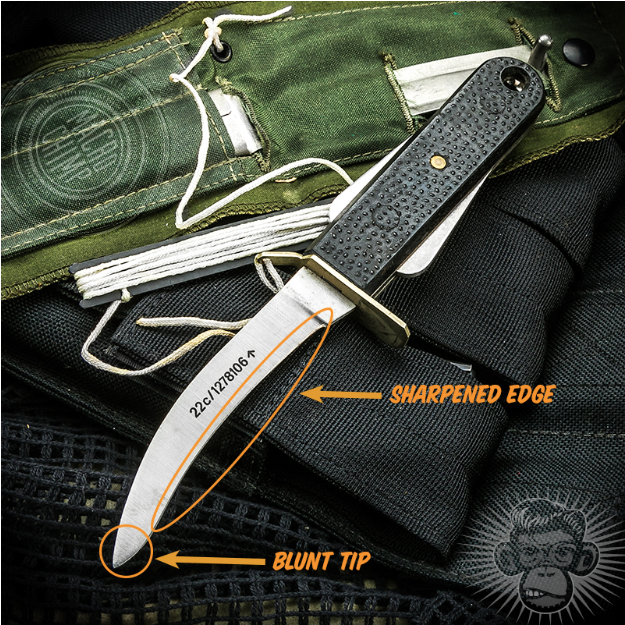 That bend in the scabbard pulls the retention stud away from the handle enabling you to pull the knife out. While the MK3 could surely be used defensively, it would not be the best choice for that job and I would assume the SAS carried it for the same reason as the RAF: for emergency cutting. In fact, in the movie, one operator gets hung up on his rappelling rope and is cut down using a MKIII. Even on the sharpened edge, it is not sharpened all the way to the edge. The last half inch or so is left blunt. Here you can also see the lanyard string and spool that comes out when you pull the knife out. Hard to tell in pictures, but I would guess the SAS guys did not use this feature. In this close up you can see the retention stud and how it interfaces with the hole in the handle to keep the knife securely in the scabbard. Drawing the knife is very intuitive and fast: just squeeze and pull. You can pretty much do it in one motion. The scabbard is a single piece of stamped metal. It totally encompases the blade so there is no chance of pressure or bending causing the knife to poke out of the sheath. Fantastic, informative article. Always wondered about the functions and features of this knife. Look forward to more of these gems of background.